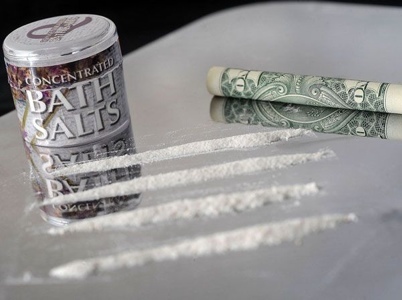 UTICA — A synthetic drug known as “bath salts” is being blamed for three incidents of bizarre behavior over the weekend. First, on Friday night around 10:40 police had been called to a home on Downer Avenue where a 20-year-old man was reportedly acting abnormally and aggressively, having threatened to kill his mother and other family members. Officers say Aubrey Vails had ripped a door off its hinges and was punching a car in the driveway. He was arrested without incident and charged with criminal mischief. Second, around 6:00 p.m. Saturday Utica Police officers were called to Stanley’s Bar on Court Street to check on a woman described as ’emotionally disturbed’. When an officer approached the 41-year-old, who was reportedly sweating profusely with a blank stare on her face, she allegedly lunged at him and tried to bite his face. Police say she screamed that she wanted to “kill someone and eat them.” The woman was taken into custody and sent by ambulance to St. Luke’s Memorial Hospital for a mental health evaluation and treatment. The hospital determined that the woman was under the influence of the synthetic drug known as “bath salts”. Police say they have chosen not to release the woman’s name, but criminal charges could be filed at a later date. Finally, later Saturday night, police were called to the Radisson Hotel on Genesee Street about 8:00 pm for a report of a man locked in the women’s bathroom for two hours. When police entered the bathroom they found 30-year old David Nichols, of Noyes Street in Utica, who appeared disoriented and had broken the bathroom light. Police say they found two hypodermic needles and ‘bath salts’ in Nichols’ possession. He has been charged with trespassing and criminal mischief. Last week, Utica Police arrested 35-year-old Gino Placanica after they say he tried to force his way into the Parkside Court home of his three-year-old son’s mother by violently kicking at the door. While Placanica was trying to break down the door, police say the child was screaming, “Stop daddy stop.” Police say they found Plancanica hiding on the roof of the house sweating profusely with white residue on the outside of his mouth, complaining of shortness of breath.